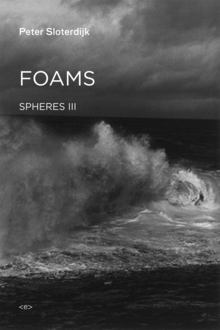 Foams completes Peter Sloterdijk’s celebrated Spheres trilogy: his 2,500-page “grand narrative” retelling of the history of humanity, as related through the anthropological concept of the “Sphere.” For Sloterdijk, life is a matter of form and, in life, sphere formation and thought are two different labels for the same thing. The trilogy also offers his corrective answer to Martin Heidegger’s Being and Time, reformulating it into a lengthy meditation on Being and Space—a shifting of the question of who we are to a more fundamental question of where we are. In this final volume, Sloterdijk’s “plural spherology” moves from the historical perspective on humanity of the preceding two volumes to a philosophical theory of our contemporary era, offering a view of life through a multifocal lens. If Bubbles was Sloterdijk’s phenomenology of intimacy, and Globes his phenomenology of globalization, Foams could be described as his phenomenology of spatial plurality: how the bubbles that we form in our duality bind together to form what sociological tradition calls “society.” Foams is an exploration of capsules, islands, and hothouses that leads to the discovery of the foam city. The Spheres trilogy ultimately presents a theology without a God—a spatial theology that requires no God, whose death therefore need not be of concern. As with the two preceding volumes, Foams can be read on its own or in relation to the rest of the trilogy.